Well 2019 is hotting up with a whole swag of ARM based Chipsets migrating to modern v4.9+ Linux Kernels. The latest is the new ODROID N2 that looks like a wee beastie indeed for between USD$63 - 79 for the 2GB or 4GB model. 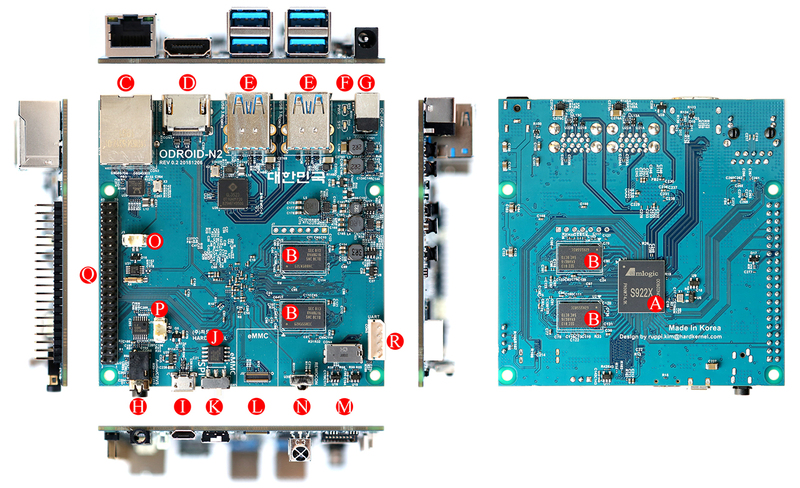 ODROID N2 - will need stable Linux support before any CoreELEC Kodi software release. Linux GPU drivers are already available. Its a AMLOGIC S922x soc i hope there will be better GPU drivers. How did you reserve it? (2019-02-18, 19:31)Sholander Wrote: How did you reserve it? lol, he's reserving the post (#2) so that info can be added to it at a later time. Not a device itself. No need to reserve anything when you have a long association with HardKernel. The developer pre-production boards have started arriving this week into the hands of the CoreELEC developers and support work has commenced. My N2 arrived this morning. I'm really impressed with the design of the integrated, machined, metal bottom case/heatsink and the slide on moulded Lid. Makes for a tidy looking package when all closed up. Feels more like a Mini PC than an AMLogic board. Both CPU governors are default set to "Performance"
With the heatsink design I cannot see these being CPU - thermal throttled. The onboard DAC should be interesting for media player usage. (2019-02-19, 11:02)wrxtasy Wrote: Makes for a tidy looking package when all closed up. I have read the new SoC will make life harder for LibreELEC/CoreELEC devels, I hope this will just be a matter of time! I hope this gets Libreelec one day. It's much easier this time around (vs AML S912) now we have actual ARM -->> AMLogic licensed Linux G52 GPU and Frame Buffer drivers Kodi can use. The next hurdle is to see how much of a mess the (Android centric) AMLogic modded v4.9 Linux Kernel is in for Linux Kodi usage. Device with this specifications with CoreELEC (or LibreELEC) + RetroPie would be almost perfect setup for me. This looks like a very interesting board imho.